Guurtje was born in 1946 in Schagen in the Dutch province of Noord-Holland. Being the eldest child in the family, she grew up on her parents’ farm. She started helping her father in the stables and on the land when she was very young. It was then that her intense connection the land and earth was initiated, a connection that is still growing today when working on her ‘estate’, de Zonnetuin. Working with nature, plants and animals are the foundation of her life. Guurtje has two children, a daughter (1968) and a son (1970), and two granddaughters that enrich her life as well. Guurtje developed her knowledge over a long and winding path through life. She has no ‘formal’ education or diplomas, besides the Dutch ‘entrepreneurial skills’ certificate enabling her to run her own business. She has worked in a painting company’s office and an anthroposophic book/toy shop, designed clothing, which she sold through boutiques, and has done a great deal of work with young people in many different area’s. 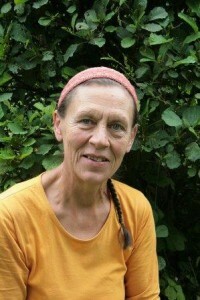 In the 1980s she worked for a biodynamic horticultural company and a biodynamic herb company. After a lengthy period of travelling through India, North Africa and elsewhere in search of herself and the meaning of life, she was led to Alkmaar – to the allotment-garden complex ‘De Rekere’, where since February 1990 the Zonnetuin has gradually developed. For six years, Guurtje worked hard, using all the knowledge she had gathered to give form to the garden. This round garden is home to many kinds of vegetables, herbs, berries, fruit trees and a great many native flowers. In 1996 someone asked her to give a course in what she was doing there, and that’s when the education activities started. Her teaching has expanded so much that for the last few years de Zonnetuin has offered a complete year-round programme. The year 2000 was a major turning point for Guurtje. She learned how to communicate with the plants, trees and the creatures living in the soil and how to work and communicate with the spiritual worlds of the angels and the invisible earthly etheric forces, the nature spirits. Guurtje is inspired by anthroposophy, the philosophy of Rudolf Steiner. Anthroposophy made her aware of her life task: to inspire and inform people about humankind’s great assignment, to reconnect heaven and Earth. A path to spiritual development in the garden or in nature can enable one to connect with the deeper mysteries of the Earth and the cosmos. This is the essence and meaning of the ‘dynamic’ element in biodynamic practice: the individual who reconnects the spiritual worlds of Earth and the cosmos by walking their own spiritual path. In 2011 Guurtje reached official retirement age, and it was time to take it ‘a bit easier’. Now that Carmencita de Ruiter has taken over much of the teaching, Guurtje will have more time to assist and inspire people looking for further spiritual learning. She will continue this work through writing and by giving lectures and one-to-one talks with people that are open and interested.